In 2004, a substantial Palki and two Holy Scriptures - a Guru Granth Sahib Ji and a 18th century hand written bible – went missing during the official administration of a Sikh company belonging to the well-known Bhabra family of broadcasters and engineers. So far KPMG have failed to return these unique religious artefacts. The unique Palki Sahib was designed by Panminder Bhabra and built by his select craftsman. The Guru Granth Sahib ji remains as a permanent unchangeable guide for all Sikhs as a living Guru or Teacher. 18th Century Guru Granth Sahib Ji is the central focal point of Sikh worship, and copies of the Guru Granth Sahib were painstakingly prepared by Sikh scribes over many years. For over 45 years Hardial Singh Bhabra has been a staunch supporter of the community and the Gurdwaras throughout the UK, giving seva irrespective of costs, as has been acknowledged by the senior members of our established Sikh Religion. Over the years, through his successful business in the Broadcasting industry, he has donated a number of substantially constructed Palkis. 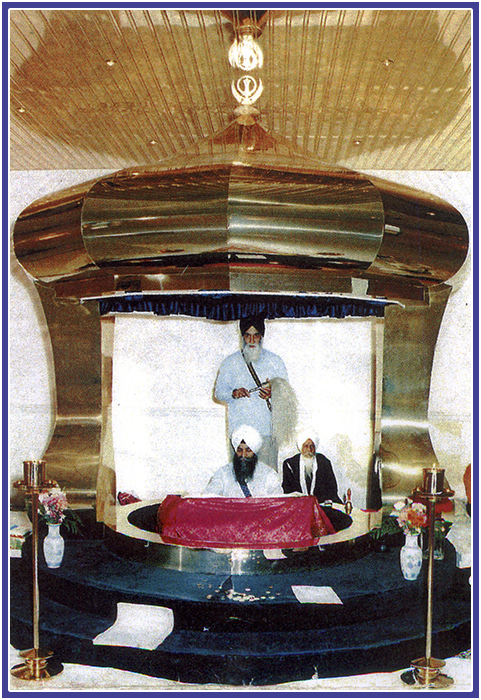 The Palki that went missing in 2005 whilst in the possession of KPMG was specifically constructed in readiness to launch a revolutionary International broadcast of Daily Live Gurbani to the Sikh population of the UK and Europe – the first of its kind. The project was jointly developed by Hardial Singh and Patwant Singh, the world-renowned author and spokesperson of the Sikh Religion. On completion of the programmes, the Palki together with the Guru Granth Shaib Ji were to be handed over to the community. This specific and unique Palki was designed by Panminder Bhabra and built by his select craftsman. Using high quality materials. In particular this Palki is constructed of hardwood, birch profiled sheet, sub frame and covered in deep gold laminates. At the very top a 24 carat gold Sikh Symbol displays is ethnicity, and giving its prized appearance, to gracefully accommodate the placement of the Sikh Religious scriptures. Known as the Guru Granth Sahib Ji. One of many donated by Hardial Singh Bhabra to the Sikh community. It is well known that the Guru Granth Sahib, the holy book of the Sikhs, bestowed the title of the eternal Guru by Guru Gobind Singh himself, giving it the same aura and celestial light that shone on the original Sikh masters. In keeping with tradition the Guru Granth Sahib Ji, is placed with respect in a special palanquin, a Palki, befitting a Sikh Guru. It is at the centre of every Gurudwara, the resting place of the eternal Guru. 'Waheguru', 'wonderful lord'. Seated on top a raised platform, the Manji Sahib, the Guru Granth Sahib is fanned by the Chauri, made especially of animal hair, an ancient tradition reserved for royalty. That aura and respect accorded to the Palki goes back to the birth of this holy text. "The Fifth Guru Guru Arjan Dev had gone to the Gobind Darbar to compile together the various works that formed the Guru Granth Sahib. There Guruji prepared a palki, a palanquin, for the Guru Granth Sahib to be carried in. History has it that Guru Arjan Dev carried this 'Palki' himself bare feet. People urged him to sit on a separate Palki himself, as he was a Guru too. But Guru Arjan Dev refused, saying he would carry the Guru Granth Sahib himself as its religious reign would be eternal," a priest at the Harmandir Sahib tells us. "At Nanded, Guru Gobind Singh gave up his physical existence, passing away into eternity. In the presence of five of his followers, he performed five rounds (parikrama) of the Guru Granth Sahib and bestowed eternal guruship on the Guru Granth to be followed by Sikhs forever. In all gurdwaras and many Sikh homes, the Granth is read every day. No Sikh ceremony is regarded as complete unless it is performed in the presence of the Guru Granth Sahib. On a daily basis, Sikhs receive a hukam or divine order in the form of a hymn from the Guru Granth Sahib, either in a Gurdwara or at home. The hukam is the first hymn of the holy book from the left hand page when it is opened at random. Similarly, at the end of a service, after the ardas, the Adi Granth is opened at random and a portion is read. Many Sikhs do this daily, regarding the verses as words from God which they will find helpful during the day. This is called vak lao, taking advice. According to Sikh history, the first akhand path was performed by Guru Hargobind, the sixth Guru, after the death of his wife, Mata Damodri ji. An akhand path was also performed by Baba Deep Singh ji when he pledged before God at Damdama Sahib to sacrifice his life for the protection of human rights. The central focal point of Sikh worship, copies of the Guru Granth Sahib were painstakingly prepared by Sikh scribes, sometimes taking years to complete their task. As Sikhs moved from a period of persecution and struggling for survival in the early 18th century to an era of sovereignty culminating in the Sikh Empire of the first half of the 19th century a renaissance of Sikh calligraphy flourished in Punjab as Sikh patrons commissioned decorative copies of the Guru Granth Sahib. These Religious scriptures can never be replaced and therefore are priceless, beyond imagination.